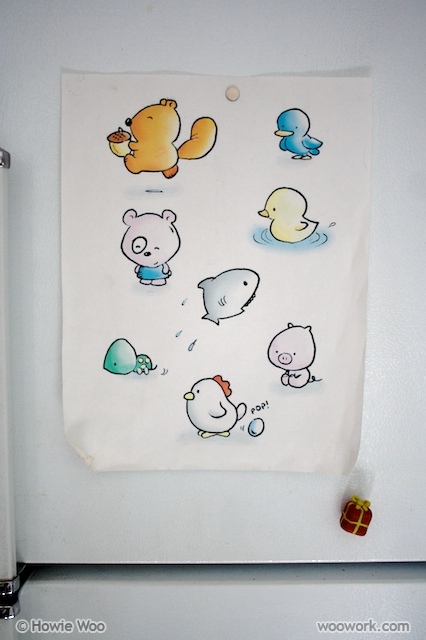 On my fridge are eight animals I drew in 2001. Eight years later, I'm remaking them into crochet animals. The seventh Fridge Critter is the Pig. For many humans, the taste of bacon is so crispy, so juicy, and so right. But when a pig wants to taste bacon, is it so wrong? After years of increasing curiosity, Piki the Pig secretly asked another Fridge Critter to find him some bacon. Two strips on a plate. Piki promised himself: Just one bite. Even after he devoured the bacon and turned away in shame, he knew he wanted more. Someday soon, Piki the Pig would eat bacon again. So wrong, yet so cute! Ha ha!! That is so cute and funny... pigs have always been my favourite animal (I even had a collection of toys when young). Looks great! That's definitely the cutest cannibalistic pig I have ever seen. Ooooh no, that's cannibalism, Piki!!! Piki!! Don't feel so bad you are not alone with your love of a "fallen comrade"
one more to go.. can't wait..
what will you do once done?? Ah he's so cute, I don't care if he's a cannibal. He's utterly, utterly adorable for all that. I love your critters sooo much!! Cute story! Love the pig! He is adorable! You posts never fail to crack me up ;-) Thanks for the mention on your 'recent mentions'. lol Your posts are soo funny! I had to go and read some of your past blog posts, and there is rarely a blog that makes me want to do that. He's so cute, as are the others! QBug: hehe I like it: Cute Wrongness! PaisleyJade: Thanks! I'm also a fan of real-life pigs, especially when they're running around and oinking. I hope you resume your pig toy collection! TADA's Revolution: Yes, if he's going to be a cannibal, he might as well eat the crumbs! I have a feeling he did. Yes, one more to go! I'm editing a video right now for the last Fridge Critter post! Shorty: Thanks! It's been fun taking the critters outside this summer too! *Tea: I'm glad you found my blog through the Flickr photo site, and that the story added to the cuteness factor! Flickr has a fun community. Symon Burton: It's good that cannibalism can still be funny :D Thanks again for mentioning me on your blog. Zu: I'm glad you went back in time to visit my past blog posts! (I wish I got a little younger in the rare times anyone did that ;) Thanks a bunch, I'll be following your crochet & baking blog too, especially if you feature more of your peanut butter cookies, my fave! 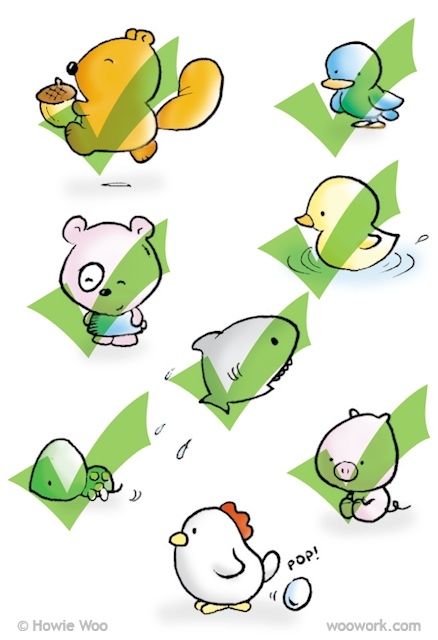 JenGoPop: haha only your chicken-munching birdie knew what Piki feels like ;) My gf and I recently realized that most fish are cannibals too! how did you get two teeny pieces of bacon and a teeny little plate!? Piki is so cute! 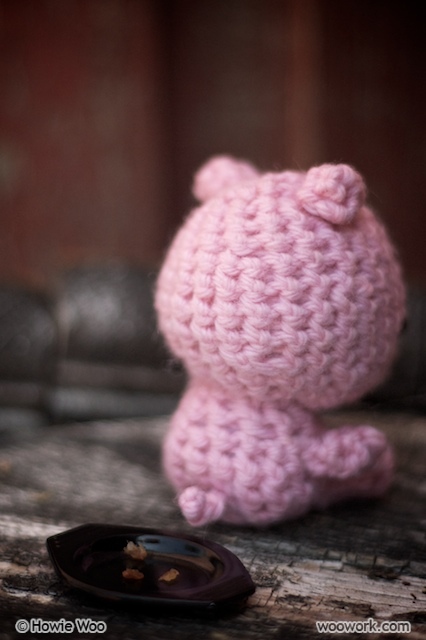 Much more cute then my crochet pig Arnold. Oh, my brother and I have really been enjoying your blog. Frizz: I'm so glad to hear you and your brother are liking the blog! The badminton video you made with him is so funny. its perfect! 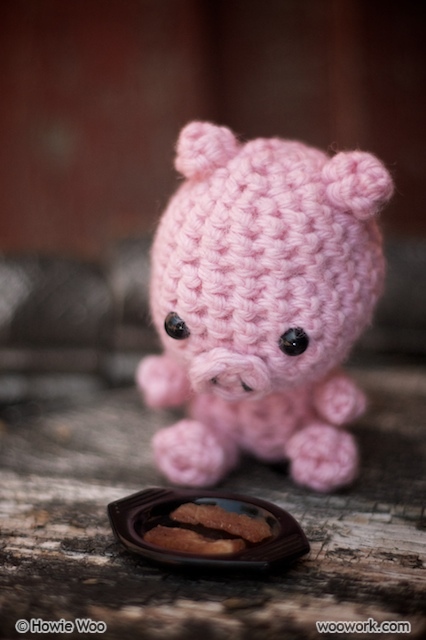 My friend forwarded your blog to me because she knows I love cute little piggies and I love bacon! Thanks for the smile.